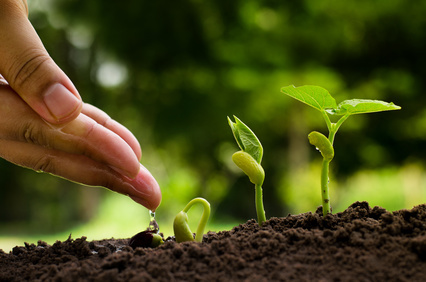 Nurture Your Business… Start Small, Grow Tall. I have always been curious about the way large monopolies such as Apple, Google, or Amazon came to be. It seems as though every business owner looks at these corporate giants through narrowed eyes and a hand stroking their chin, wondering what exactly the secret is to build such a fruitful business. With this question in mind, I started reading some books to gather clues for the winning traits of these companies and stumbled upon a book that effectively taught me how to grow a business. Peter Thiel, co-founder of PayPal, wrote a hint for a successful startup in his book Zero to One: “The perfect target market for a startup is a small group of particular people concentrated together and served by few or no competitors” (54). The whole idea behind this quotation is essentially to be patient and start small. The way to become a monopoly is to start off by dominating a small market of your target audience. You have to find your niche and cater to only that niche exceptionally well. Having a few dedicated customers is better than have many uninterested customers. Once you’ve captured your small but strong audience, you can now begin to expand your market. The trick about growing your market, however, is to move to the closest thing to the market you already have. You just want to dip your toes in territory that isn’t too far from your own. This kind of growth is slow but steady. If your business is good at what it does, this should work well. So, if your goal is to become a large corporation, be sure to start with a strong grip on just a handful of loyal people, and when you’re ready, work your way to a bigger slice of the market.